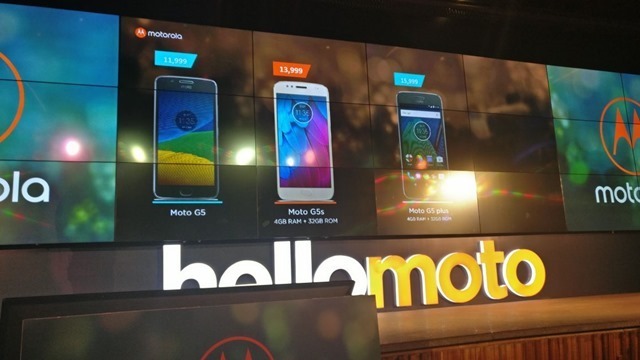 Motorola has launched two new special edition Phones in India. The first of these is the Moto G5s, while the other is the G5s Plus. Basically, the Moto G5s is a better version of the Moto G5, with some improvements in almost all the hardware specs. The Moto G5s has a full metal body with the large camera dial like the other phones in the series. The device sports a 5.2 Full HD 1080 display with Corning Gorilla Glass. The phone runs on Android 7.1.1 Nougat with a stock Android experience, and is powered by a 1.4GHz Qualcomm Snapdragon 430 octa-core processor. The device has 4GB RAM and 32GB of internal storage. In terms of photography, the Moto G5s features a 16 megapixels rear camera with PDAF (Phase Detect Auto Focus) , Fast Focus and an LED Flash. The front camera on the phone is a 5 megapixels selfie lens, also with an LED Flash. The device is backed by a 3000mAh battery, which supports 15W turbo charging. The Moto G5s has been priced at Rs. 13,999 in India. The phone will be available for purchase, from tonight exclusively via Amazon India, and in offline stores such as the Moto Hub and other major retailers. Moto G5s launched in India and here are the phone's tech specs.